Why are emergency pager systems of the utmost importance? Emergency pager systems for doctor’s rooms. Emergency pager systems for hospitals. Emergency pager systems for retirement homes. Benefits of having an emergency pager system in place. When a patient is critically ill, and cannot shout for help, the patient can secure himself in the knowledge that help is a tap of a button away. Managing staff of Doctors rooms, Medical facilities and retirement homes will also feel secure, knowing that their patients can request help at the press of a button. The emergency pager system also serves to make the patient’s loved ones feel secure in the knowledge that technology has been invested in to ensure that patients are well-looked after. Every doctor’s room should have an emergency pager system. The simplest system for a doctor’s room is a call button, that is placed at reception, and a light that is placed in the doctor’s surgery. In the case of an emergency, the secretary will press the call button, alerting the doctor that there is a patient in need of urgent treatment. It is essential that every hospital has an emergency pager system. Call buttons must be mounted to the bedside. We supply these call buttons to hospitals all over South Africa. 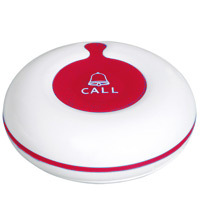 All call buttons are water proof and wireless, and can be mounted in bathrooms and showers as well, in cases of emergencies. Emergency pager systems also have receivers. 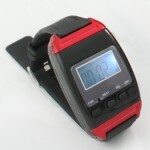 These can either be wrist watch receivers, LED lights or display monitors. These receivers are used by the nursing staff, to determine which patients need assistance when a call button is pressed. Each receiver has different display and sound settings. These settings can be adjusted to the preference of each hospital. The emergency pager system can also monitor response time of the nurses to patients, thus ensuring quick response times of nurses, and more productivity from staff. The most popular emergency pager system used in hospitals includes all the receivers. The call buttons are mounted to the bedside, as well as in the bathrooms and showers. Wrist watch receivers are worn by nursing staff, so that they can respond to notifications even while on the move. LED lights are placed above the doors of each hospital room or ward, and display monitors are placed at the nursing stations. Managing staff at hospitals can monitor the response time of staff members, to ensure maximum productivity at the hospital. For an elderly person, a retirement home must feel like a safe haven. The assurance that they will be well taken care of is of utmost importance to them and their families. When choosing a retirement home, an elderly person would consider how reliable staff members are at responding to a request for assistance, and whether technology is in place to request assistance from staff members. Retirement homes that have emergency pager systems in place, gives the elderly that much more re-assurance that they are indeed in good hands. Monitoring of the response times of staff members, also ensures residence and their loved ones that the nursing staff at the retirement home will respond promptly when a call button is pressed. 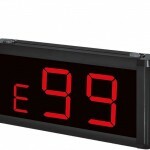 Wrist watch receivers, LED lights and display monitors can also be used at retirement homes. Response time of staff members can be monitored. If a patient or resident has a complaint of requesting help and not receiving assistance timeously, managing staff are able to check the response time of the staff members, which will help resolve complaints. Managing staff will also be able to track which staff members respond promptly to patients or residence, and address staff members who don’t respond to patients on time. Another benefit of having an emergency pager system in place, is to make patients and their loved ones feel secure that the medical facility has invested in technology for the well-being and security of their patients. The emergency pager system is wireless, and easy to install. Staff members using wrist watch receivers can respond to a patient’s call request even while on the move, as they will receive an instant notification when a call button is pressed. With the emergency pager system being wireless, call buttons can be worn around the neck on a lanyard, and residence will be able to request assistance where ever they are in the retirement home. When the call button is pressed, the receiver displays a notification immediately alerting staff members that a patient needs assistance. The call buttons are water-proof, and can be mounted in the bathroom or shower, where accidents are prone to happen. If there is a power cut, your emergency pager system will still work, as it is wireless and works with batteries. The batteries on the call buttons only need to be changed once a year if pressed only one to two times a day. In this article, emergency pager systems for different facilities were discussed in detail. If medical facilities install an emergency pager system, it will boost the confidence of a patient or resident, who will know that help can be easily requested. Not only that, but the hospital or retirement home will gain a reputation of making the needs of their patients and residence a priority.